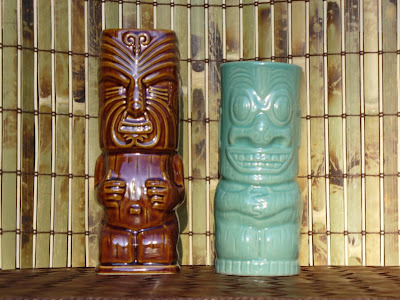 The LAST Final Tiki Update of 2008? Stop the presses! The mail came today. My friend Dan (of Ultimate Solitaire fame) sent me a birthday present! It's a wahine mug from Harvey's Lake Tahoe. 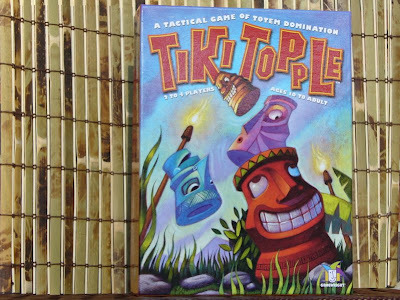 There was a tiki bar called Top Of The Wheel there in the 60's-70's. 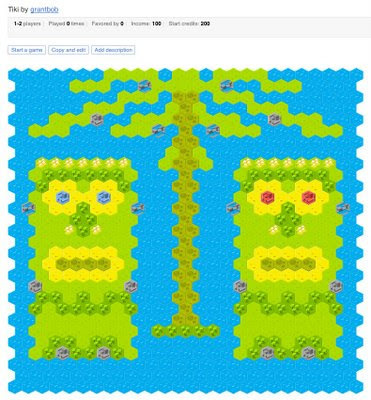 Someone blew it all up in 1980. It's a bit hard to read as the paint is almost washed off (definitely a well used mug) but it says "Sail With Harvery's" on the sail of the outrigger. This style seems to be more rare than some of the later ones with more ornate logos out in the whitespace of the mug. 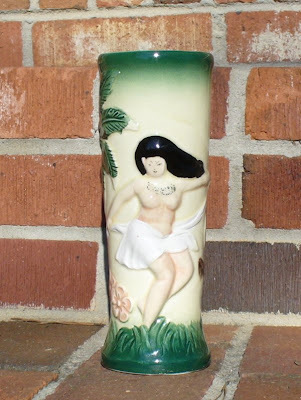 It's stamped JAPAN on the bottom and is probably from the Otagiri Merchantile Company. Definitely an early one. 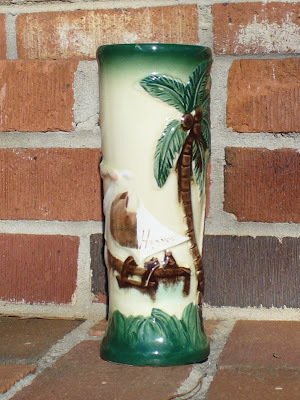 I have a couple of Tiki Farm reproductions of similar mugs but this is my first and only REAL wahine mug. Thanks Dan!!! 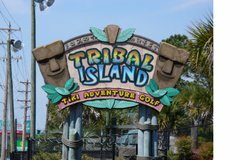 Final Tiki Update of 2008? 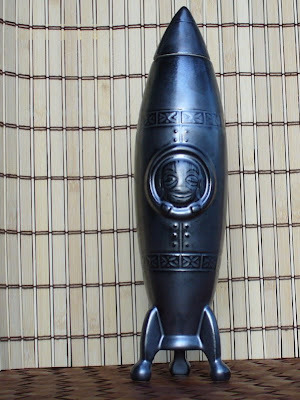 In November I finally ordered my Intergalactic Island Hopper decanter from Tiki Farm. I'd been trying to get this one for years it seems. When it was first announced it wasn't available. Then its release was delayed... and delayed again. I quit looking for it. Then it finally came out and sold out before I managed to snag one. They came across one last box of them somehow and I finally got mine. 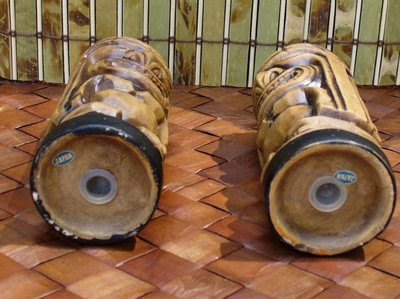 What tiki wouldn't want its own spaceship? Along with this shipment I picked up Sam's Seafood Maori and Marquesan. 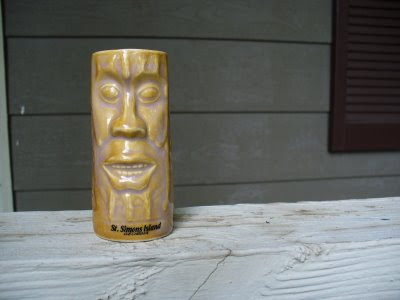 Sam's is gone now but its spirit lives on as Kona. 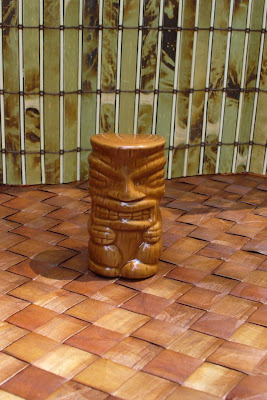 I particularly like the squareness of Sam's Maori. It might make it hard to drink out of but it looks pretty neat. 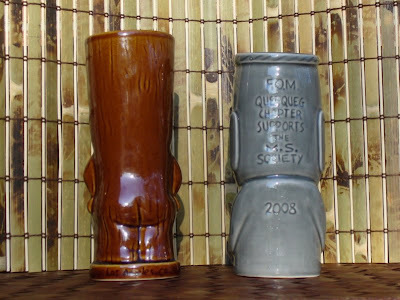 Then in early December I finally placed my order for the Queequeg Chapter of the Fraternal Order of Moai's MS Society Tiki Mugs. This was a very limited run of 200 mugs made to raise money for the National Multiple Sclerosis Society. I squeaked in at #186 of 200. The swirly bits (hair?) on this one are great. 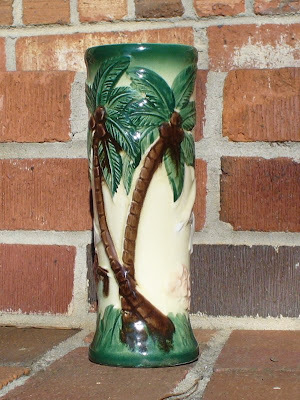 Then for Christmas, Heather got me a Trader Vic's Los Angeles Limited Edition Tiki Mug. Check out those cheeks! 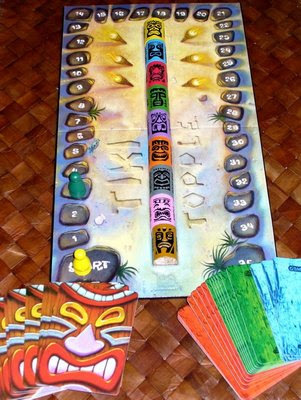 Then to top it off she also gave me a game called Tiki Topple. 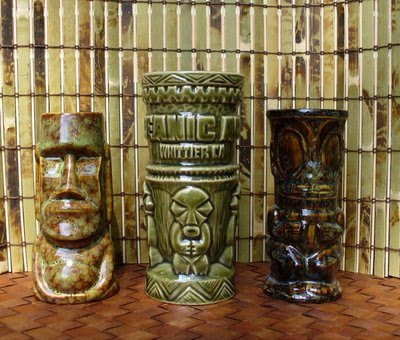 It's very nicely designed and has very cool tiki pieces. 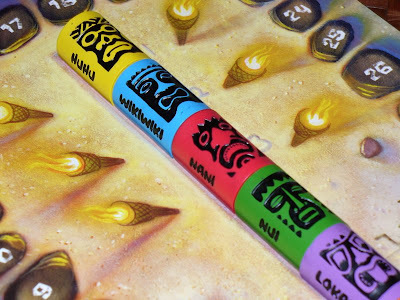 It's quite fun and requires a little more strategy (and luck) than you might first think. We went to the Georgia Aquarium today. 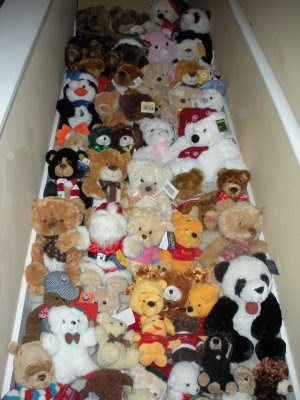 Dave and Danielle have a Christmas party ever year where everyone brings a bear to donate to the local fire department. But I'm out here anyway. I'm going in there where its warmer. 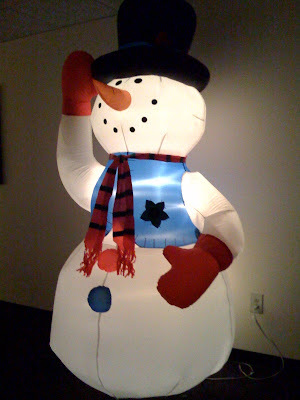 I'm the Assistant Tenant Safety Warden for our office. 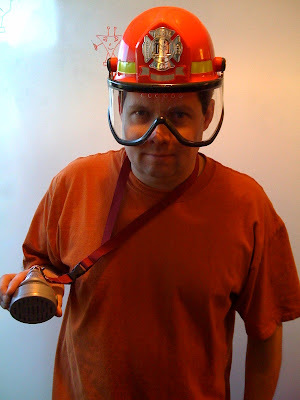 Margo (not her real name) got me a cool fire helmet with this thing on it that has lights, a siren, and and an amplifier to talk through while giving evacuation orders. I had to surgically remove the electronics from the mask as it crushed my face with the mask down. 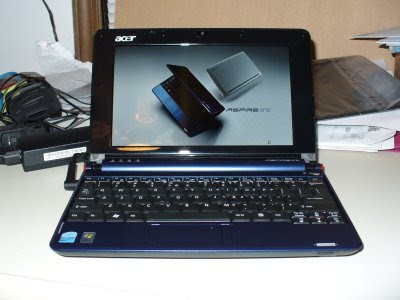 It is now safely separated as a hand-held unit that I have attached to a lanyard. Thanks Margo (not her real name). We all feel safer now. People are bugging me to join facebook. Should I? Shouldn't I? 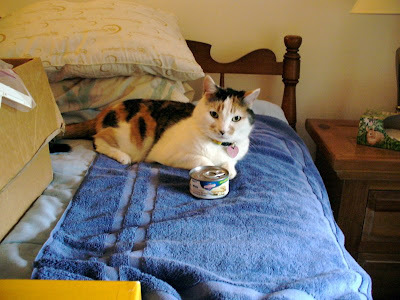 I put a poll on the left hand side of the blog. Let me know what you think. The poll closed on 12/1/08 with No beating out Yes 17 to 15. This is what I would have chosen anyway. So in any case.. no facebook for now. Plus I think the name is really dumb. I've watched Ted Allen and the PopSci guy microwave some soap a few times on Ted's Food Detectives show. It looked really cool. 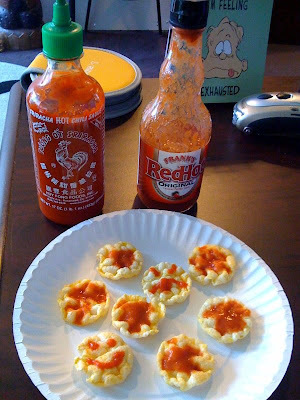 I wondered how it would work with some glycerin soap we got at Disney World last year. I cut off a piece and gave it a try. It eventually bubbled and started to foam but was not as spectacular as the one on TV (maybe I should try Ivory or something). Anyway... what it did do is fill the microwave, kitchen and now the house with the intense smell of the soap. I can barely breathe. Ugh. Heather will probably think it smells nice when she gets home. Don sent me a link to this cool Rezillos video from '78. MoAM? did a cover of this and it's always been one of my favorites. That got me watching YouTube. Now you can watch The Genuine Miracle of Pyrex. 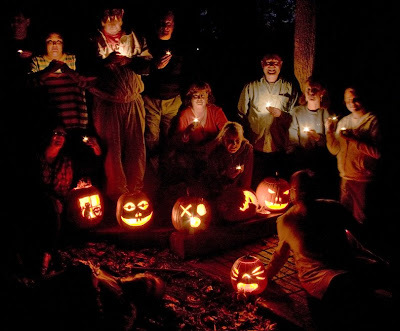 It's pretty spooky. 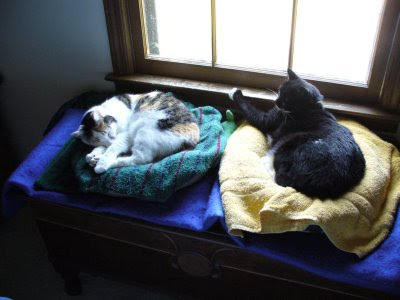 It's finally cool enough to put the SnuggleSafes under the cushions in the cat beds. Yay. I guess since SquirrelBoy got one I'll be a lemur and chime in. Several years ago my friend Sam told me about Keurig. I had a Senseo and was content. I made my own pods for the most part. I kept watching the Keurig, Senso, and other single serve brewer news over at SingleServeCoffee.com. Even though I really liked the coffee the Senseo makes and the crema-like layer it would put on top, I was constantly lured to the variety of K-cups available. Most coffee pods are in bags of 18 or so. Once you open the bag, you've opened them all. Then I feel committed to use that bag before opening others. Each K-cup is sealed until you put it in the machine and brew it. So I can buy a few boxes of a bunch of different coffees and brew whichever one I happen to feel like drinking at the time. It's like being as the Baskin-Robbins of coffeedom. Here we are with some Gloria Jeans Cappuccino flavored cofeee. I think I had underestimated the ease of use of the Keurig. The Senseo was not hard to use by any means but it did require a little more rinsing and wiping etc. 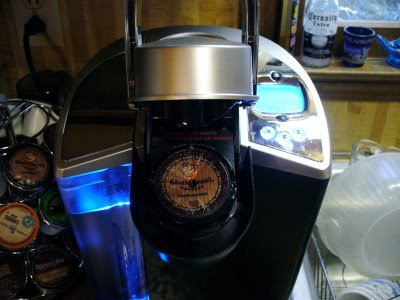 With the Keurig you just drop the K-cup in, close the lid and push a button. When the coffee is done about a minute later, just open the top and remove the K-cup. Done. Good decent coffee with little fuss. I've been able to find K-cups for $0.25-$0.44 each. That's a bit pricey compared to just brewing a pot from ground beans but it's a heck of a lot cheaper than buying a crappy cup of coffee somewhere. I also think I wasted more coffee by brewing a pot of 6 cups etc. when all I really wanted was one big mug. It also comes with a "My K-cup" thingy that basically contains a reusable filter basket you can fill with your own coffee. So when I just want a cup of Chock Full O' Nuts (so much for being a coffee snob now) I can brew one up. There are also things out there like the K-cap that will let you reuse K-cups. We've been having a lot of trouble with the AC freezing up any time the outside temperature isn't insanely hot. We've fixed coolant leaks, charged the system and it's still not happy. This is all the crap Walt scraped off my evaporator coil this afternoon. 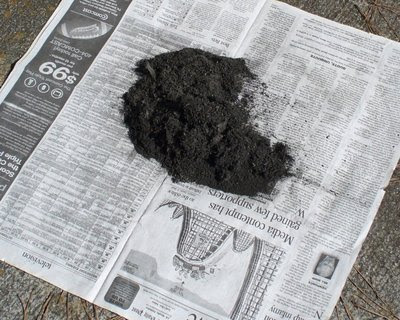 I'm guessing that's probably 15 years worth... or possibly 30 if they didn't clean it when they replaced the furnace. 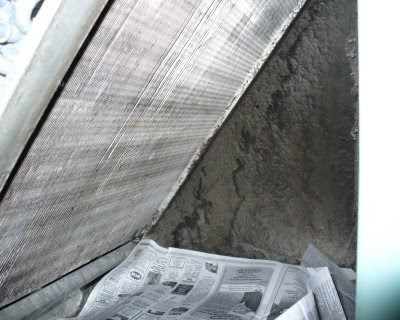 Above is how the coil looked after scraping the dry crap off. It then got a nice coat of cleaner/foam and was closed back up. 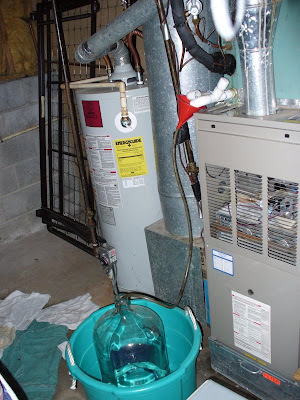 The condensate ran brown afterward. I'd have to say this must help. It's running now. We'll wait for the sun to go down and see how it does. 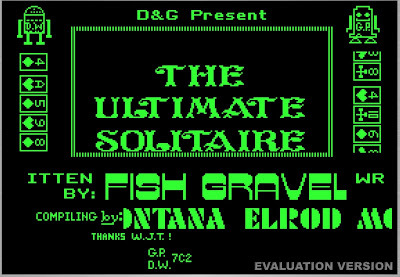 I had completely forgotten about Dan's version of Solitaire for the Apple //e that I had wrapped some happy graphics around and out on The BBS to share with the Apple ][ world. I still have my //e and can see it from here. I probably still have the original disk too. 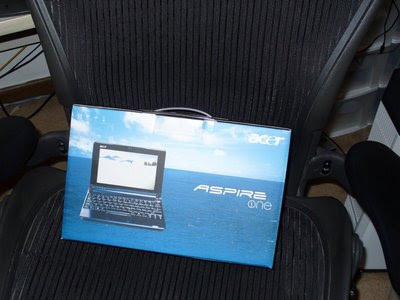 However it was easier to go find an emulator and boot it up here on the Mac. Whoa... all the wild scrolling begins. Yep. That's it. 7C2... we were really geeks back in high school. 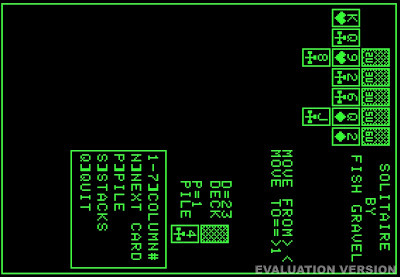 It was pretty good solitaire for the Apple ][ too... I wonder how many people ever had their monitors on their sides to play it? 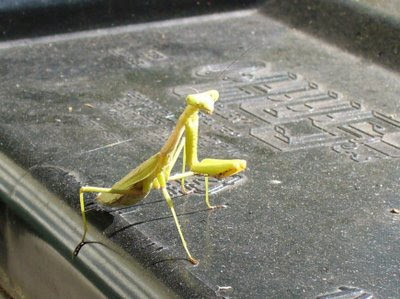 Zorak came to visit me today. He's hanging out at the trash can. I'm having my coffee at Kim's this morning. A week or so ago I was out and about in search of a new bottle of falernum as my trusty bottle of Sazerac Co. falernum was just about out. I had a hard time locating much of anything and a few searched of the internet indicates the the Sazaerac Co. quit producing it a few years ago. UGH! 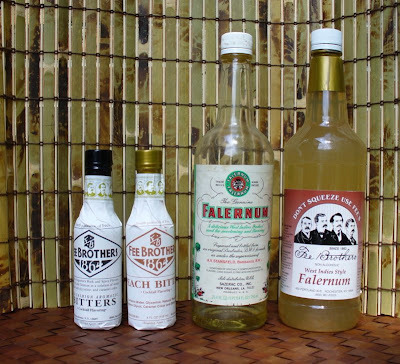 I finally located some Fee Brothers falernum down near Decatur at Toco Giant. The Fee Brothers stuff is pretty good. It doesn't quite have the same level of "tang" and crispness that the Sazerac falernum has but it's very close. The basic spiciness of the falernum is all there. One notable difference is that the Sazerac falernum contained 5% alcohol and the Fee Brothers falernum is non-alcoholic. Perhaps the alcohol in the Sazerac version helped free more alcohol soluable compounds from the spices it was made from. The world may never know. Shake until frothy. Strain into cocktail glass. BTW... if someone locates Angostura Orange Bitters somewhere near Atlanta please let me know where you found it. I've read good things but can't find it around here. What would you call it? Better, yet, make one and then make a suggestion. I'll wait about a week to see what people come up with. 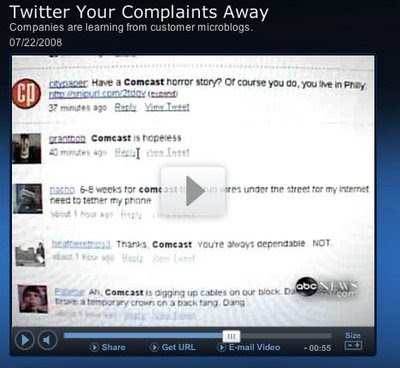 Please post your suggestions as a comment. I guess... We need more billboards. 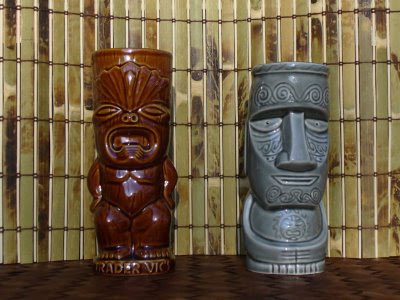 I've also got a couple of new ones from Tiki Farm on the way. Maybe I have a problem. I've been planning on making an online catalog at some point. 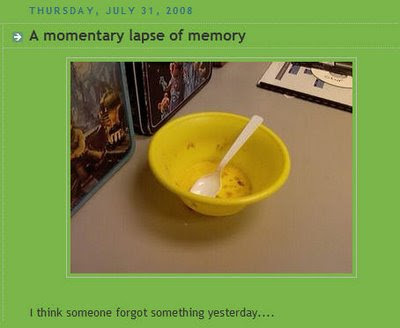 I'll be taking a picture of each item and recording as much as I can remember about it before I forget where/how I got it. After this quick count, the thought of such a process scares me. I bet pneumatic people tubes could work through the interweb too. After fighting with my air conditioner for the better part of Saturday morning I eventually made it out of the house. I was hoping to hit some garage sales early but it was already a bit after noon so I figured I was best off hitting the local Goodwill stores and the "antique" stores that surround them. I haven't figured out who made them yet. They're from Japan so it's definitely not some recent casting. 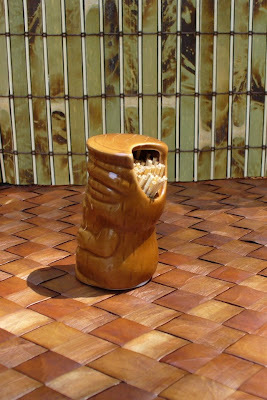 Then within a few feet I found this hand-carved tiki napkin holder. This will hold my bar napkins quite nicely some day. It was really dirty but cleaned up well looks good with a nice coat of Formby's Almond Lustre. Other than that I didn't find much. 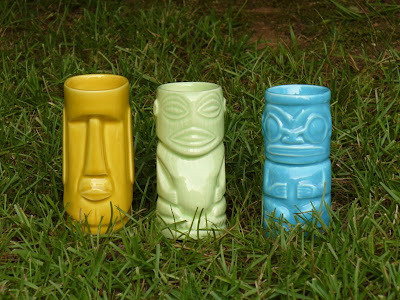 The Larryville Goodwill had 4 plastic tiki cups that I passed on (I already have a few of them and they were not a nice as a different model that Bear found me some more of last weekend.) The same store also had a coconut monkey. It wasn't in great shape but even if it was I would have passed. I already have a coconut monkey. 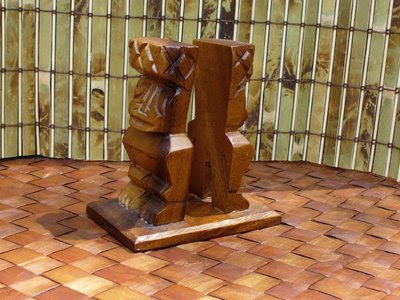 While no collection of tiki junk should be considered complete without one, I believe one coconut monkey is enough for anyone. As long as the camera was out I figured I'd grab a few shots of a toothpick holder I found at Walgreens a few weeks ago. I think I paid 67 cents or something for it... with toothpicks even. I have him tucked in the kitchen cabinet next to some of the standard bar tender's guides. Next time I need to put a cherry in a Manhattan I'm ready. 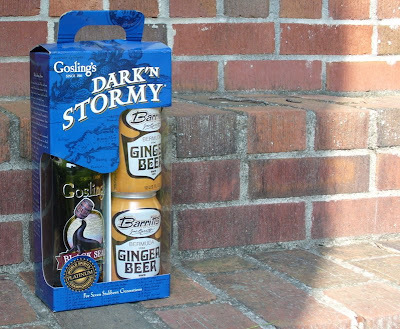 Today got dark 'n' stormy at work and then it cleared up and the sun came out. 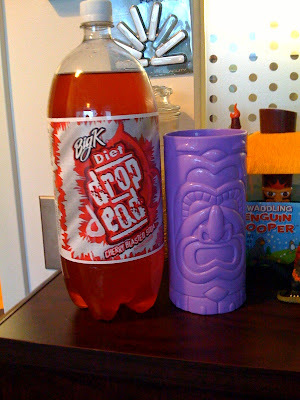 It was a fairly long day so why not try a new drink. 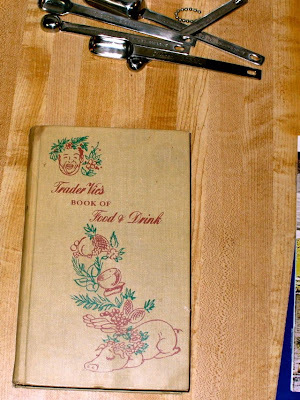 I got out my 1946 copy of Trader Vic's Book of Food & Drink to look for new adventure. 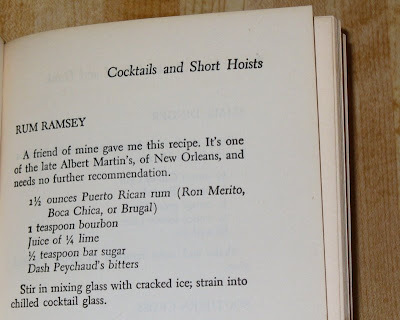 I picked the Rum Ramsey. I had everything... and it used some Peychaud's bitters so why not? Not bad. I really like the touch of bourbon and the spice from the bitters. It has just enough sweetness to round it out without being "sweet." I think mine had just a bit too much lime. I guess "juice of 1/4 lime" can vary a bit depending on the lime (not the best way to measure I guess). I found this version that calls for 1/4 ounce of lime juice. Maybe I'll try that next time. 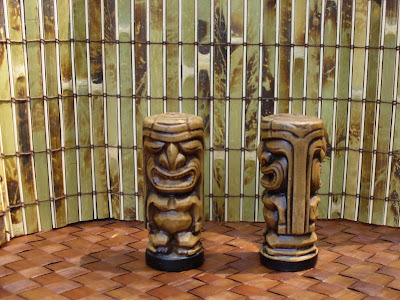 These three are from a boxed set that Tiki Farm used to sell consisting of: Yellow Moai, Green Rarotongan, Blue Marquesan & Purple Lono (click for picture). 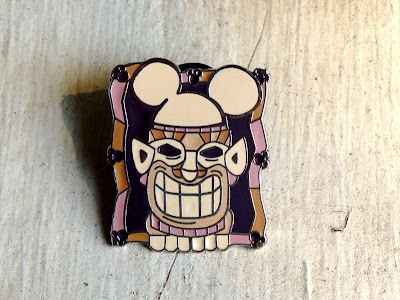 If someone happens to run across Purple Lono please let me know or go ahead and rescue him for me. 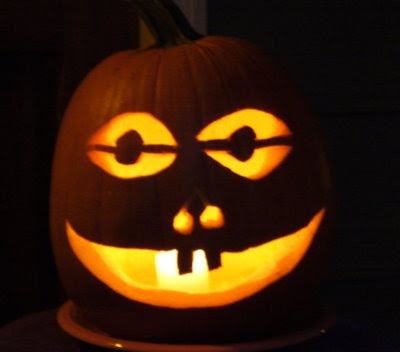 It may bring you good luck. Since I bothered looking up DeKalb and Gwinnett's the other day and found Fulton's today at lunch I figured I'd share (Cobb's is not available online right now so you're on your own over there). Every few years my condensation drain line gets clogged up with algae and other junk. I've tried to pour a little bleach in it every now and then to keep it happy but every once in a while it gets its way, plugs up, and gallons of water start covering our basement floor. The way it drains is annoyingly stupid but I won't go in to that. This time I just hacked the drain line and have it dripping into a funnel, through a tube into a 6 gallon carboy. I can get 4-5 gallons or so of condensate in about half a day. Makes me wish I had some plants worth watering outside. They sure are heavy though.